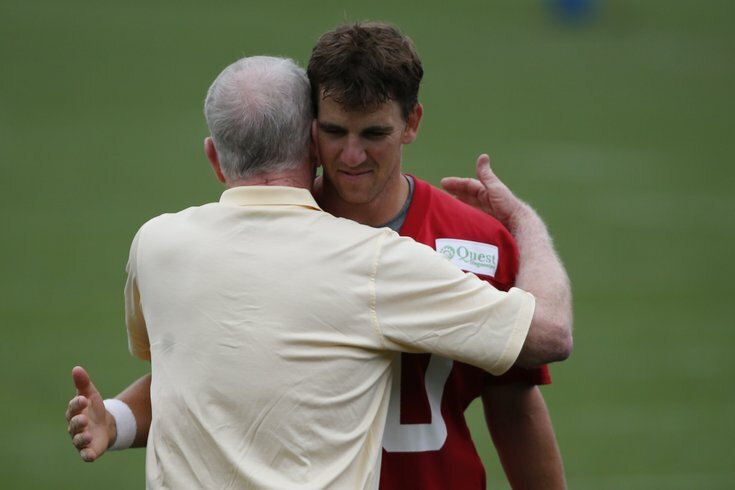 Eli has needed hugs after 19 of his last 32 starts. 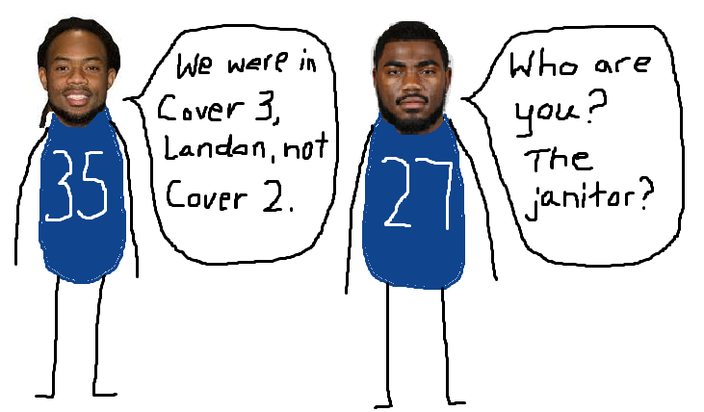 This week we're taking a look at each of the Eagles' divisional enemies, in detail. Yesterday, we blasted the Redskins. Today's target will be the New York Giants. To note, we will not be talking about the positives of any of the Eagles' NFC East rivals, because, well, that's no fun. This will be 100 percent vitriolic. Also to note, this will be published in the Eagles Almanac, which you can pre-order here. Statistically, 2013 was easily Eli Manning's worst season. A year later, statistically, 2014 was arguably Eli Manning's best season. So wait... Why is that a reason they'll be a dumpster fire in 2015? Well, going into any new year with the Giants, their prospects of a successful season ride on the play of Eli Manning. Last year he was really good, and they still sucked. Gordy has been on four other rosters before landing with the Giants, mainly as a slot corner, but is the mentor of the group in terms of experience. In other words, the remaining Giants DEs get to the quarterback 0.196 times per game. If I'm the Giants, and I know my job is secure long term, JPP is a goner and I'm carrying his $15 million over into next year's cap. However, with Tom Coughlin and Jerry Reese on the hot seat, they're probably looking at the "other" DEs on their roster and talking themselves into keeping JPP around a little longer. 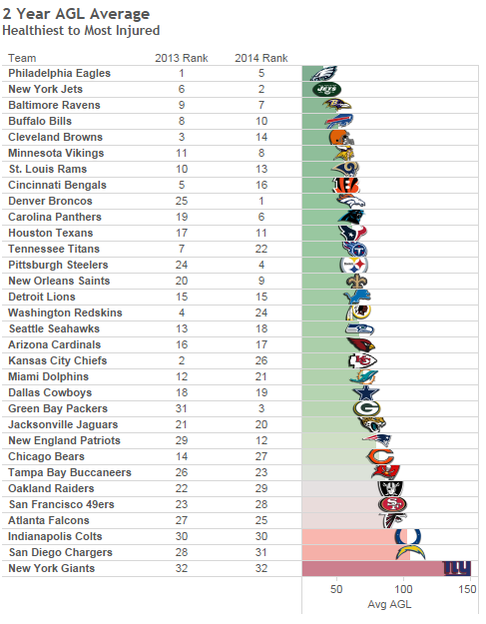 The Giants have been the most injured team in the NFL over the last two years. You can call that bad luck. Maybe. Much has been made of the Eagles' #SportsScience program, and they were the least injured team in the NFL the last two years. 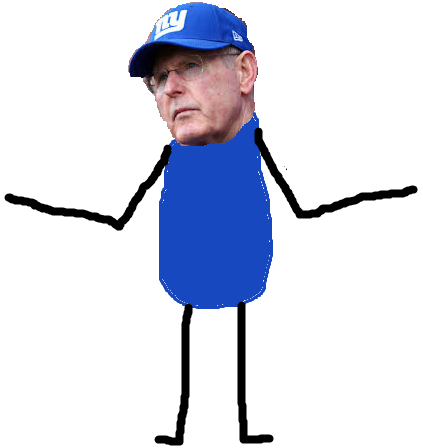 Former Giants defensive back Walter Thurmond recently said that Tom Coughlin "doesn't believe in modern medicine." We'll call the Giants' program #SportsAntiVaccer. I can understand why Jason Pierre-Paul wouldn't allow the Giants to visit him in the hospital. He didn't want Tom Coughlin telling him to rub some dirt on his hand. OK, so obviously, Thurmond went a little far with his "modern medicine" assessment, but there is certainly evidence to support the Giants' inability to stay healthy. The Giants will be without starting LT Will Beatty for the season, after he tore his pectoral muscle lifting weights. As a result, rookie first-round pick Ereck Flowers will be asked to start immediately at LT, and it was thought that Justin Pugh would slide back out to his previous spot at RT. However, Pugh's 32" arms were the shortest of any offensive tackle competing at the Combine since 1999. 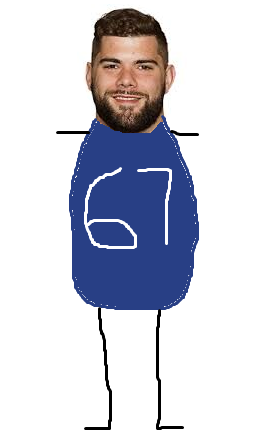 As a result, Pugh and his T-Rex arms are better suited to move inside to guard. Instead, it appears that Marshall Newhouse will fill in at RT. That could potentially severely hurt two positions along the Giants' OL. A season ago, the Giants couldn't run the ball to save their lives. They averaged 3.57 yards per carry, which was 30th in the NFL, and had an NFL-low four rushes of over 20 yards. 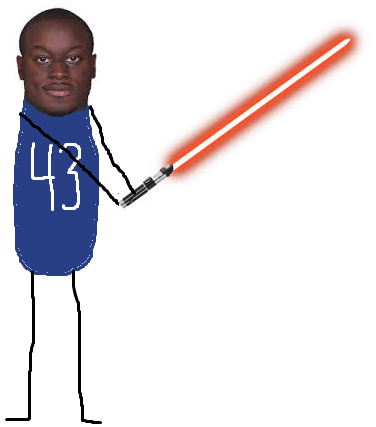 Orleans Darkwa sounds like a bad guy in a Star Wars movie, by the way. Cruz's career arc reminds me a little bit of Miles Austin's. After Austin's breakout (81-1320-11) 2009 season, the Cowboys handed him a six-year deal worth $54 million. His numbers steadily declined from there on out. In 2013, after his two good seasons, Cruz cashed in with a five-year deal worth $43 million, and has produced very little since. 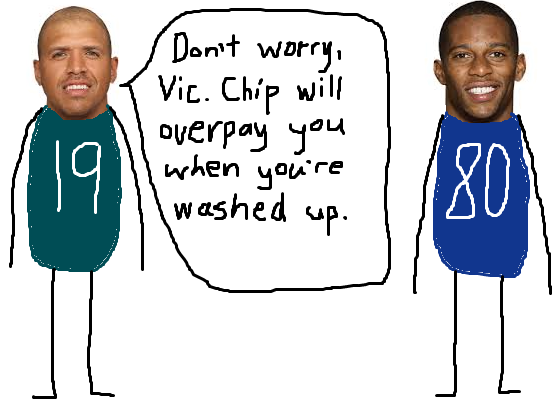 But he does seem to be a chronic soft tissue guy, kind of like, um, Miles Austin. The Giants have stunk the last couple seasons, their coach is on the hot seat (again), and they've had a lot of nonsense happen this offseason (Beatty's injury, JPP's love of fireworks, and their punter running his mouth). ...which means some weird stuff will happen this year and they'll win the Super Bowl again.